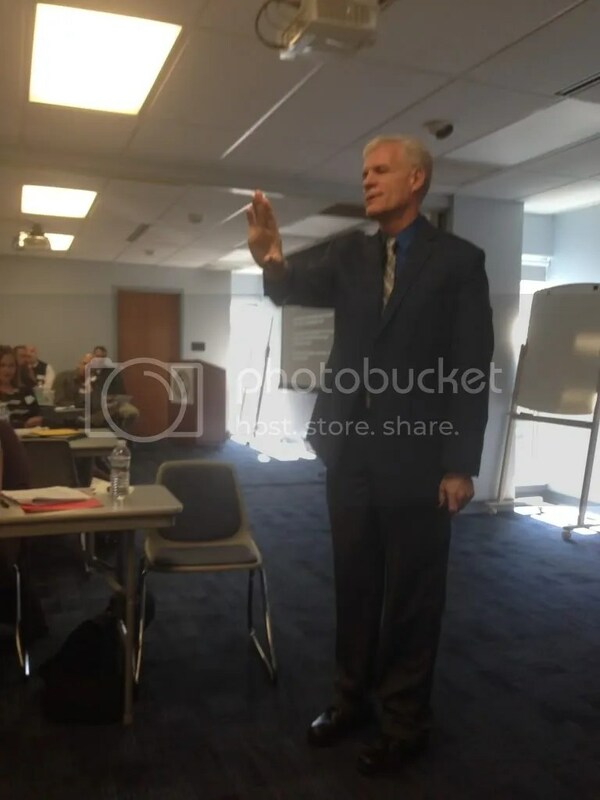 Earlier this week, a handful of colleagues from my district and I experienced the educational whirlwind that is Rick Wormeli. I have studied Rick’s writings for some time now, shared thoughts on redos and retakes and standards-based grading before, and incorporated some of his ideas into my own classroom procedures. What I most enjoy about Rick is that he challenges your existing classroom practices, and breaks them down to their foundations: if it’s not about achievement, and moving kids forward, then it’s not part of the plan. Today will be a waste of your time. Thanks? But Rick’s point was that a single day of PD is simply not sufficient to synthesize these ideas. Change only comes when we take what we learn back to our school, have discussions, think about our policies, and work as a team to do best for our kids. Rick is correct when he states that “school is set-up to meet the needs of those who get it first”. Let’s work on breaking down long-standing policies and drafting new ideas which benefit all learners. While the day was billed as a “formative assessment” seminar, the concepts really be-bopped from standards-based grading, redos and retakes, learning targets, and formative vs summative assessments. I fear this blog post would be 10 pages long if I tried to summarize everything, so I’ll instead focus on one idea I have incorporated into my classroom routine this year: test retakes. How do students react to the grades we give them on assessments? How do our grading practices impede students reaching their learning targets? Rick argues that many of our strategies cause students to wind up in “the pit”; further, many schools perpetutate practices (like losing lateness points, or not allowing corrections) disguised as “teaching responsibility” which cause students to fall deeper into the pit. It’s our duty to lead students through strategies which will get them out of the pit, and professionally unethical to conflate evidence with compliance. Educational Leadership, “Redos and Retakes Done Right” – requires ASCD log-in, harass your principal! Video on Redos and Retakes – Rick defends the redo/retake practice. Each unit test has two parts: multiple-choice and free-response, graded equally like they will be on the AP Exam. After the exams are handed back, students may come in to take the “replacement question” for the exam. The replacement question is a third free-reponse question, which students take on their own time during a daily directed-study period, or after school. The grade on the replacement question replaces the score on the lower-scoring question from the unit test. We don’t have a procedure for recovery for multiple-choice. But we are kicking some ideas around. Here’s why this procedure has worked for us. Unit learning doesn’t end with the chapter test. Students need to go back, reflect upon their misunderstandings, and develop a plan for doing better on the replacement question. It’s great to see kids really reflecting about what went wrong on their test, and coming back to clarify what went wrong….that simply didn’t happen before. This is the first of what I am sure will be many posts reflecting upon this special day of PD. Looking forward to sharing more ideas, discussions, and anecdotes! This entry was posted in Statistics, Uncategorized and tagged redos, sbg, wormelli. Bookmark the permalink. I get the arguments and I’m in complete agreement, I’m wondering how to convince some stubborn coworkers for grade level comparisons. I run into the same thing here; stubborn colleagues who hold onto past practices. Rick provided some prompts at the seminar which I should share in my next posts. They are hypotheticals designed to cause teachers to think about their practices. For example: Joe gets an A on every assessment, but does no homework. What should his grade be. I would look forward to your next post then. Your example is a common debate we have had in the past. I was sharing this idea today with our middle school, and a veteran teacher latched onto the idea, so I’ll be curious to see if she’ll lead the newbies into this concept as well. Especially as we design more common core like assessments, allowing the kids to retake a different free response assessment it part of the conversation we have been having. We started with a CFA, based on a rubric and we have extended that as we have started to design some performance tasks. I’m finding that, for some people, re-dos or flexible deadlines just seems to impinge on their inherent sense of fairness. This sense has been reinforced by school experience (they played school well and were rewarded) and even life experience (maybe they worked for a boss who was a stickler for deadlines). Despite data to the contrary (I have it!) and the work of researchers like those cited by Rick Wormeli and Tom Guskey, they just keep insisting re-dos or flexible deadlines are unfair. These people are in the minority. But I’ve had some experience with obstinance… and it leads me to believe I’m not going to change their mind. They’re wrong, and they could do better for kids, whether they are teacher or parent. But they’re not going to do so. Thanks Wes. It’s going to take a lot of us “foot soldiers” to evolve from broken policies. It’s easy and feels safe to give a test and move on. We must do better. I’ve really enjoyed this post. I, too, have been largely happy with the results of the redo-s as the students are “learning” what they were supposed to. But better yet, they are excited too because they are thrilled they can retake the assessment for “full-credit” instead of averaging the scores. This is really a new way of thinking for me. Ive allowed redos before in the past, but usually only under certain circumstances. And in the past I would average their grades on the assessments. I never gave it any thought; instead it’s how I thought I was being fair. I never asked the students to do any reflection or remedial work but just to come to me within a week to retake it. I was gulity of running a factory instead of a instructional environment. Obvioiusly, that’s all changed now – Thanks! Totally agree. There is often a sentiment amongst those I chat with here that redos are OK, but they must somehow count for less credit than the “real” test. Rick really makes the case that this is deeply flawed thinking, and it has changed my whole approach. Lookign forward to growing more with it. Sometimes we forget that a conversation can count as strongly for assessment as a written test, and I love how your method allows for this. We have to give kids the chance to moe themselves out of “the hole”. Always a pleasure hearing what happens down in the science neighborhood.